Mazal Tov to Evan + Elle!! This awesome couple gathered their friends and family at The Rockleigh in New Jersey this past Sunday. We knew this Wedding was going to be a total show-stopper, (because if you know Evan + Elle, then you know they have impeccable style) but to say this day was luxurious would be a total understatement!! They really pulled out all the stops with their magnificent details, live entertainment around every corner, endless experiences to eat and drink VIP style at cocktail hour AND the rain held off for their sunset Ceremony!!! This was our first Jewish Wedding we’ve ever photographed and WOW, they are SO fun and full of so many great traditions!! Evan + Elle both wrote letters to each other and each choked up reading them!! The girls wore the cutest matching rompers to get ready in! Every time I’ve seen Elle, she’s always looked fabulous and polished. As a Bride, she took your breath away!! Her Maid of Honor said it best in her speech. “..She’s smart, and beautiful, and bubbly, and sweet… so what’s the catch? There isn’t one.” Elle is actually wonderful and so is Evan!! Both of them would give you the shirt off of their back…and it’d be a really stylish shirt. Good Lord, Evan + Elle. You both are so gorgeous!!! What I love about Evan is that he is down for all the pictures we can dream up!! Plus he totally rocks at styling his own details! He had roses patterned in his jacket and stylish slippers designed by Del Toro! 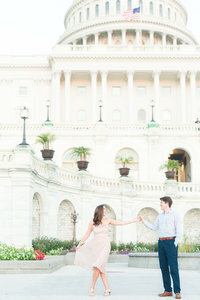 Evan + Elle chose to do a First Look in this beautiful courtyard. Elle was so excited to see Evan, that she purposely left her bouquet inside so that she could wrap both her arms around him!! 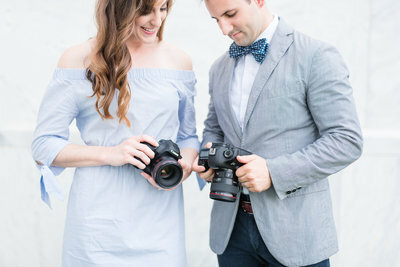 How they Met (Borrowed from their Wedding Website!) : The couple first met in October 2013 at University of Maryland on their Homecoming Weekend. While they both attended UMD for undergrad, they never officially crossed paths during college (some say that it may have been a blessing in disguise that Elle didn’t have the opportunity to meet “college Evan”). They shared a firey introduction at Santa Fe Cafe, almost as firey as the Fireball shots that Evan bought them. Unfortunately, their interaction was interrupted and the love story lingered. Fate brought them back together a couple of months later on New Year’s Eve. Elle was visiting friends in DC to celebrate. A large group of Maryland alumni was attending an event at Johnny Pistola’s, a classy bar in DC. Elle & Evan quickly recognized each other from Homecoming and began to chat. It wasn’t long before Evan swept Elle off of her feet and they didn’t leave each other’s sides all night. The rest is history! 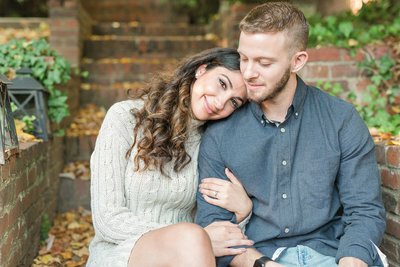 Elle + Evan started dating and began a long-distance relationship for just about FOUR years from New Jersey to Virginia!!! Face-Times and long weekends spent together became a cherished routine. 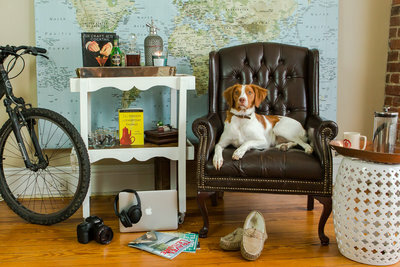 How He Asked (Borrowed from their Wedding Website!) : Elle + Evan rarely spoke of engagement and marriage. Elle did mention that she hoped whenever the magic moment did happen, that it would completely catch her off guard. Evan took that challenge to heart. He planned a romantic weekend in NYC just for the two of them – meanwhile Elle was so busy with residency that she almost had to cancel!! Evan urged her that this was a once in a lifetime opportunity when he said that his uncle had scored tickets to the Broadway show, Hamilton. They took the train up to NYC on March 3, 2017. They stayed at The W Hotel which was a special place to them after spending a few weekends there during the beginning of their relationship at the hotel’s bar, Whiskey Blue. After an amazing dinner, they went back to the hotel to kill some time before the show. 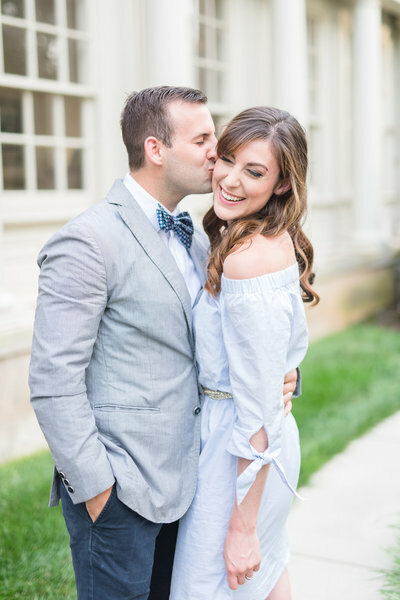 As they approached their room, Evan said, “Elle, I haven’t been completely honest with you…,” and those may have been the only clear words he was able to say as he pulled out a gorgeous engagement ring!!! The room was decorated with rose petals, chocolate covered strawberries, and champagne. Elle was in complete shock and awe!! Evan confessed they were not actually going to see Hamilton, and that white lie was his last ditch effort to persuade her to not cancel last minute!! Luckily for Evan, Elle couldn’t care less about the Broadway show…although some of her coworkers were pretty disappointed!! A photographer was waiting downstairs in the lobby to capture the excitement for the rest of the night!! …And they also saw Book of Mormon. Signing the Ketubah! The Ketubah is the Jewish Wedding Contract and the ceremony of signing it is one that close family members attend. This Chuppah was STUNNING! A Jewish tradition is that both parents walk down the aisle each with the Groom and the Bride. During the Ceremony, it is tradition that both sets of parents remain at the Chuppah with the couple. Elle walked in a circle around Evan 7 times and had blessings spoken over them before they shared wine. The Rabbi walked out into the aisle holding the freshly signed Ketubah, explaining it’s deeper meaning and tradition. 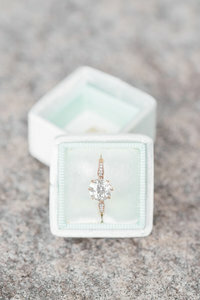 Then A white covering was placed around both Evan + Elle before breaking the glass! A chorus of “Mazal Tov” cheers and applause broke out as the two shared their first kiss as husband and wife!! The guests were treated to such an elegant Cocktail Hour! From extravagantly designed food displays to an attendant running a top-shelf Vodka Bar, eating and drinking was a VIP experience with endless cuisine choices. After you selected your choice of Vodka, the attendant would pour it down this ice luge into the shot glass before handing it to you!! The second ice sculpture displayed the couple’s new monogram! When Elle put on her Wedding dress and faced the room, she looked flawless!!! How beautiful is she?! You guys are so much fun and such a perfect match!! This entire day was so joyful, luxurious and such a pleasure to be a part of with you!! Your warm relationship is magnetic. Whether it was watching you two squeeze hands at the Ceremony or when you were twirling on the dance floor, the way you two interact is so genuine and sincere. You just compliment each other so well and it’s SUPER photogenic!! We can’t wait to see how your marriage inspires the world that true love is alive and well, especially with the Sadlers! We love you both!!! L’Chaim!! !